Looking for an affordable family getaway in the Caribbean? Consider a familiar value-oriented brand, Holiday Inn, which has three resorts and about a dozen hotel properties in the Caribbean. A chain well known to budget travelers, Holiday Inn offers a "Kids Eat and Stay Free" policy that lets children 19 and under stay free in a parent's room. At some Caribbean properties, kids 12 and under eat free from the kid's menu in the hotel restaurant when accompanied by a dining adult. It's important to know that there is a significant difference between Holiday Inn Resorts, which offer many activities and amenities, and Holiday Inn hotels, such as Holiday Inn Express properties, which are fairly basic and offer a swimming pool, standard rooms, and free WiFi and breakfast. There are three Holiday Inn Resort properties in the Caribbean that offer resort-style amenities and all-inclusive packages. They can essentially offer a well-priced alternative to an all-inclusive resort. Holiday Inn Resort Montego Bay: This budget-friendly Holiday Inn Resort in Jamaica is very popular with families. It offers all-inclusive pricing, as well as a private beach, four restaurants, two swimming pools, a spa. and arcade. There is free Wi-Fi is available throughout. Activities include tennis, mini golf, windsurfing, sailing, snorkeling, basketball, and volleyball. There is a kids center with programming for children ages 6 months to 12 years old. Children 19 and under also stay free when in the same room as the parents, and kids 12 and under stay, play and eat free. 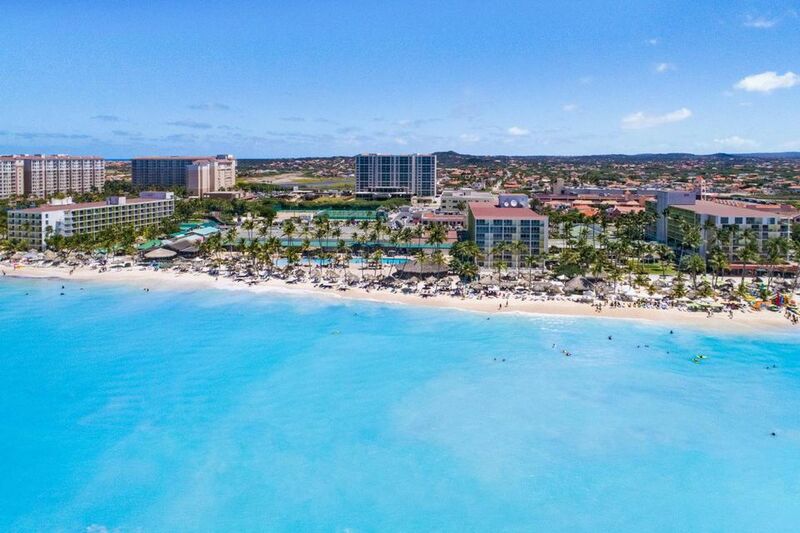 Holiday Inn Resort Aruba: This large beachfront property on Aruba's Palm Beach was renovated in 2014. Kids ages 12 and under stay and eat free here, and the resort offers an all-inclusive package for families. Guest rooms sleep up to four people and feature flat-screen TVs, mini refrigerators, and complimentary wifi. There are three swimming pools, a recreation and sports court, and a complimentary children's program for kids ages 4 to 11. Other perks at this resort include on-site laundry facilities, a fitness center and the lack of a resort fee. Holiday Inn Resort Grand Cayman: The oceanfront Holiday Inn Resort on Grand Cayman features lush landscaping, a secluded beach, swimming pool and a location adjacent to the only 18-hole golf course on the island. All-suite accommodations feature separate sitting and sleeping areas, flatscreen TVs, full kitchens, and a washer/dryer. Activities include tennis, beach volleyball, and water sports including snorkeling and diving. Holiday Inn Express San Juan Condido: This affordable hotel has a convenient location a few blocks from Condado Beach and near Old San Juan. The hotel features a swimming pool and fitness center. There are free breakfast and wi-fi. Holiday Inn Express & Suites Nassau: This budget hotel is located in downtown Nassau and features an outdoor pool and fitness center. There are free breakfast and wi-fi.